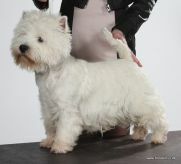 We are going to dog shows with our westies, and that is a lot of things - fun, exciting, beautiful, extraordinary. We are showing in Denmark, Germany, Sweden and so on. 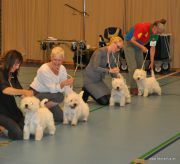 The shows in Denmark are either DKK (Danish Kennel Club) shows or DTK (Danish Terrier Club), and their mother organization is FCI (Fédération Cynologique Internationale). 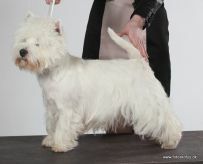 This is also the overall federation when we show in other countries. 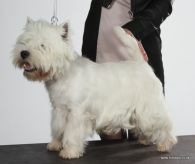 We train our dogs in showing, and make an effort in their training so they don't become show robots but they have fun and enjoy the days out of the house. 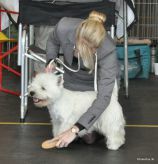 Our show team includes Mathilde and Rune, and we have been on several courses with well-known handlers so we can make the best out of our dogs. 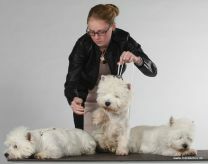 The training, working and trimming of the dogs is a fulltime hobby, and we love it. 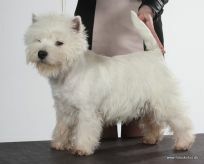 We also got a junior handler to be in the team. 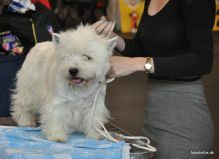 Ida Marie was at her first show placed as BIS 4, and we are looking forward to see what she will bring in the future.